Huawei's next phones coming October 16. Huawei's appearance at IFA 2017 came near the end of the show but it made a big impact with its latest chipset destined for the Huawei Mate 10. As previously rumored and leaked a day ahead of its press conference, the Chinese phone manufacture confirmed the Kirin 970 chipset. Huawei’s newest chipset features an octa-core CPU and a 12-core GPU. There are also some great leaps in wireless capabilities with a new one of the world's 4.5G LTE modem that supports Cat 18 and download speeds up to 1.2Gbps. 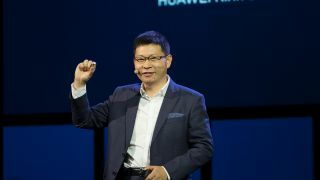 With these expansive wireless technologies, Huawei expects its future phones will support dual SIM cards at 4G without compromises. The chip is built with a total 5.5 billion transistors, which is 2.5 billion more than that of the Qualcomm Snapdragon 835. Huawei focused much of its press conference on the chip's new dual image processing engine that will support 4K HDR 10 video among many other features. It’ll likely first appear inside the upcoming Huawei Mate 10 and Mate 10 Pro which have been confirmed to appear in Munich on October 16. The Kirin 970 chipset will be built with a 10nm manufacturing process, like the competing internals from Qualcomm, Samsung and MediaTek. Additionally, the new chip focuses on artificial intelligence built into the device with a HiAI mobile computing architecture. On stage, Huawei CEO Richard Yu explained how this on-device AI and the new chipset will work together to deliver 25 times better CPU performance as well as 50 times greater energy efficiency. Hopefully this will lead to greatly enhanced battery life going from the Huawei Mate 10 to the Mate 9. Previously Vice President of Handset Business at Huawei, Bruce Lee, confirmed the chipset would be included in the Mate 10, and if that's the case we can safely assume it'll also be in the Huawei P11 as well.